The worldwide rights of upcoming Tamil supernatural thriller "Masss", starring Suriya, Nayantara and Pranitha, have been jointly acquired by Eros International Media Limited and Studio Green. The film, scheduled to release mid-2015, is the first collaboration of director Venkat Prabhu with Suriya and is touted to be the first Tamil film to be shot in 3D from the beginning. The music will be composed by Yuvan Shankar Raja. Commenting on the acquisition, Soundarya A. Rajinikanth, director - Creative for South, Eros International, said in a statement: "After collaborating with Suriya for 'Maattrraan', we are very excited to extend our relationship with this exciting project. "With this film, we also extend our partnership with Studio Green with whom we have already collaborated for the music of films like 'Darling' and 'Tamiluku En Ondrai Aluthavum'." Eros plans to continue strengthening its presence in the south and tap the potential of the Tamil industry by leveraging its tie-ups and film content. Sources say that the film is a supernatural thriller with enough comic and thrill moments to it. We also hear that the film has Suriya in two different looks which is sure to enthral his fans. According to Venkat Prabhu, Masss is not shot in 3D. 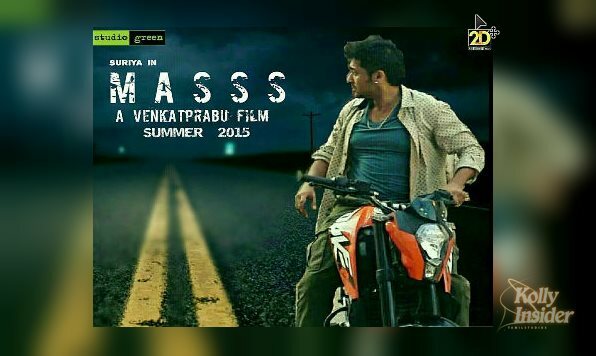 Slated for June / July release, Masss also has Jayaram, Parthiepan, Premgi, Samuthrakani, Karunas, Sriman, Vidyu Raman and many other known faces. After completing Masss, Suriya will begin work on his next, tentatively titled 24, being directed by Vikram Kumar.